This is the second in a series about The New American Home 2019. 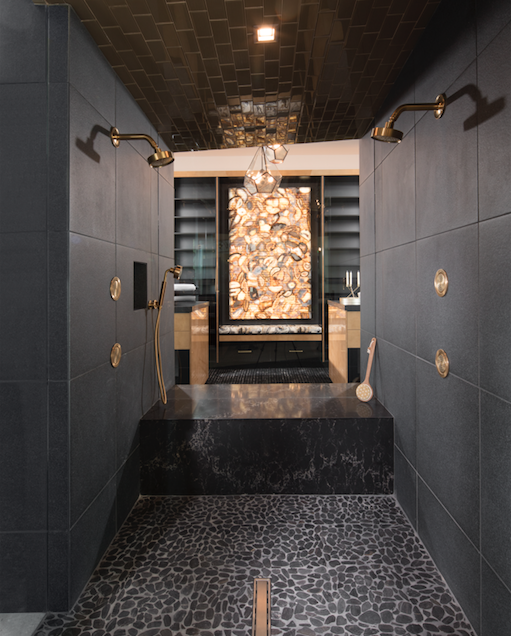 Our January 2019 issue looked at five construction details, and our March 2019 issue will focus on the home’s kitchens and baths. 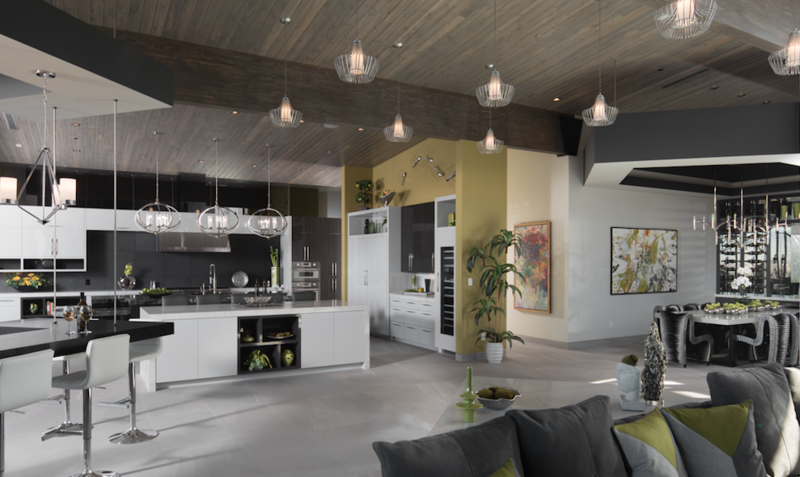 Visit tnah.com to learn more about the project, sponsors, key products, and free guided tours during IBS 2019 in Las Vegas. 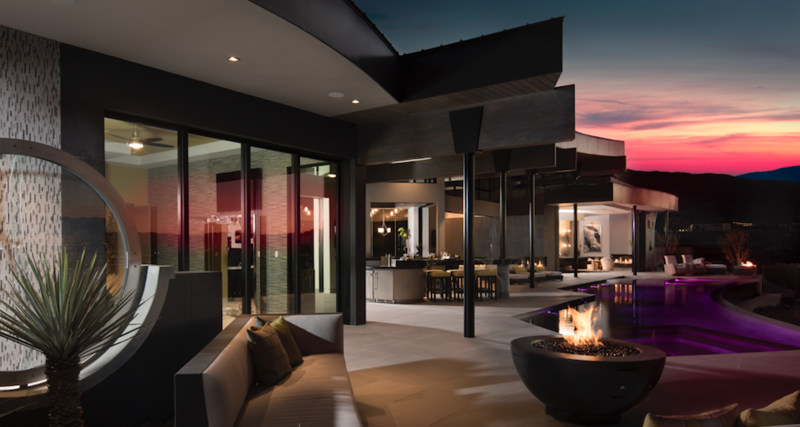 If the approach to a $6.5 million custom home built in one of the most dramatic settings anywhere can be called understated, The New American Home 2019 is it—until you pass a tapered, stone-clad column on your way into a covered courtyard, at which point the muted, mid-century-inspired front elevation fades away to a gallery of spaces that demand your attention. Not least among them is a glassed-in garage showcasing a bright red Ferrari alongside a red-felt pool table and a sports bar-like lounge. Pivot left and you’re met with the jutting prow of the study, also behind a wall of telescoping glass doors that meet in the middle of its sharp, angled form. All that, and you haven’t even entered the house yet. 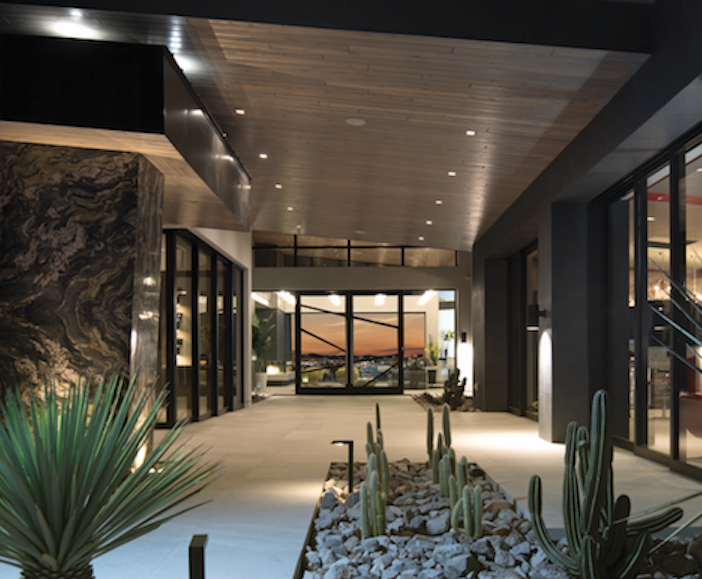 The Walk-Up: Designed for dramatic impact, the home’s covered entry courtyard affords glimpses of and access to the show garage and lounge along the right and the casita and study to the left, all of which passively ventilate and cool, as needed. These spaces also extend their footprints by sharing the same floor finish, set flush to further blur the lines between indoors and outdoors, making the spaces feel larger. Being distinctive is a Coletti trademark, one of several in this 8,200-square-foot spec home. But the courtyard is really just an appetizer for the entrée, served the second you walk through the all-glass entryway into the great room (lead photo) and are greeted with an unobstructed, panoramic view of the Las Vegas Valley and its famous Strip dead center. That view is good all day and late into the night. Facing north and protected by deep roof overhangs, the outdoor area running the length of the rear elevation rarely gets too hot, and there’s always the infinity-edge pool and a seat at the wet bar or an island fitted with a beer tap to help you cool down. Outside Integration: Every interior space along the rear elevation opens to the outdoor living area through 14-foot-tall by up to 20-foot-wide clear openings afforded by pocketing patio doors. Even the wet bar (center) shares space with the outdoors, with similar fenestration leading to the pool and lounge area. The sweeping curves of the roof and pool edges follow the arc of the property line. “It throws a curveball at the straight lines of modern design,” designer Dan Coletti says. 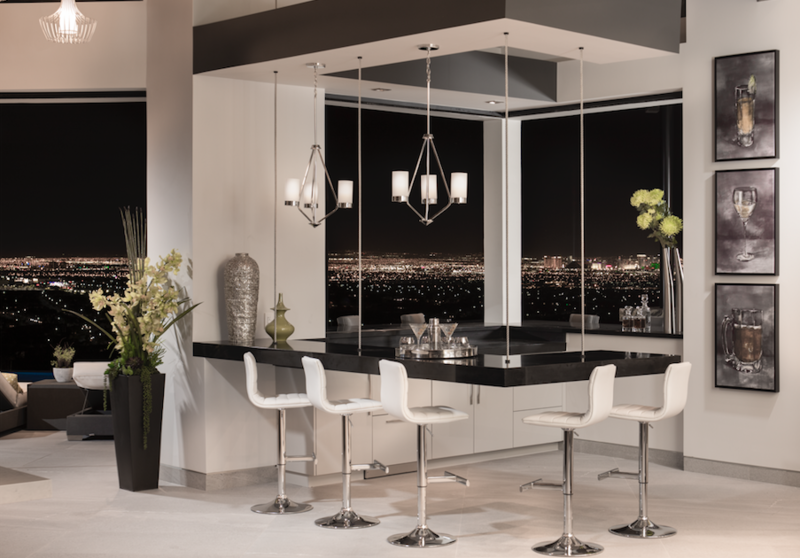 Open Bar: Angled into the main living space, the wet bar is accentuated by a cable-suspended surface, while fully pocketing windows open to outdoor seating by the pool. Seamless Transitions: Like the fireplaces in the great room, the kitchen seamlessly flows into its outdoor counterpart, the only intrusion being a narrow opening for the last panel of the patio door. The prep island’s surface is the same as the tapered column that anchors the entry courtyard, providing similar distinction in this application and a consistent thread throughout. The wall colors pick up on the hues of the veining in the island. Despite those wow factors, the house is comfortable and livable. “This is a home first. People have to live in it,” Coletti says. He’s also sensitive to different family formations, namely multigenerational, which the home’s single-story footprint, private-access casita, and flush thresholds help accommodate. Office Envy: The study located off the entry courtyard exemplifies the jutting, prow-like angles that introduce and help define rooms and spaces throughout the home. 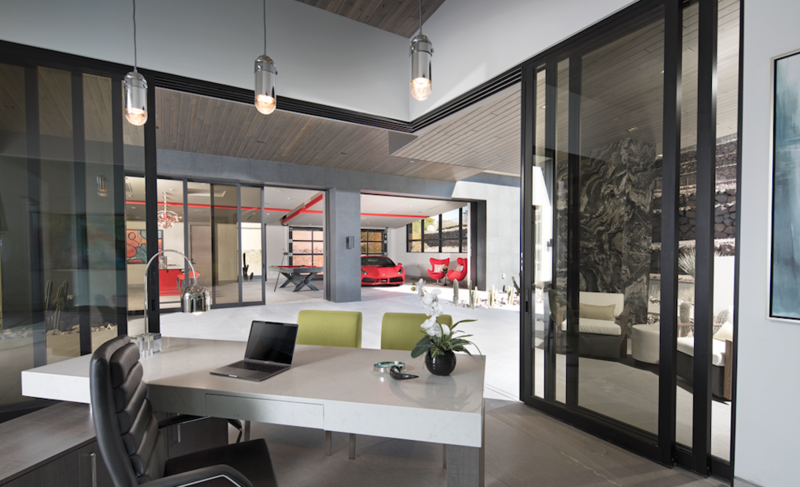 With the telescoping doors of the show garage and the study open, the two areas almost meld into one and provide an enviable view of the garage displaying a red Ferrari 488 GTB that—at least for car enthusiasts like Dan Coletti—rivals a Vegas Strip vista. Just as you round the last bend on South Valle Verde Drive toward West Horizon Ridge Parkway in Henderson, Nev., nearly 2 miles from The New American Home 2019, something unusual comes into view: a house, maybe two, perched on flat lots neatly cut into the southern hills of the Las Vegas Valley. As your view expands, you see several such lots across, below, and above, stepping up the hillside on rock-faced terraces—no trees to speak of, no golf course or water features, just a few large, low-slung homes ranging from framed to finished amid the flat, terraced lots carved into the hillside. Welcome to Ascaya. The history of this unusual 313-lot housing-only development begins in 1989, with the purchase of 670 acres of mountainside. 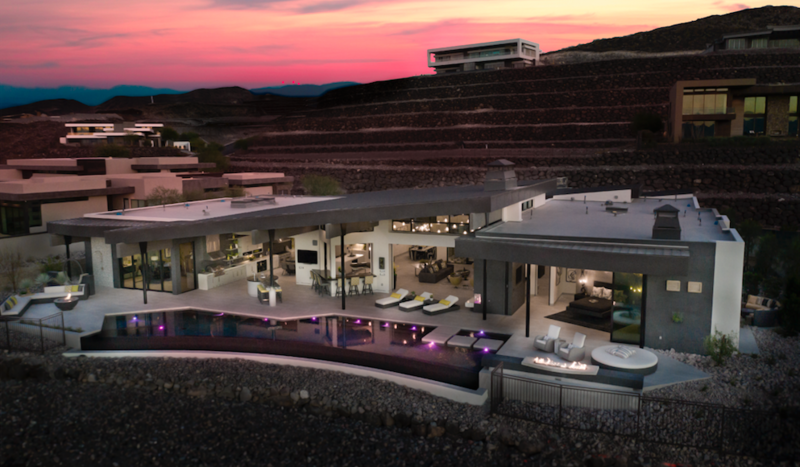 But it wasn’t until 2004 that Ascaya began to take shape, methodically stepping its way 1,000 feet up the Sloan Canyon foothills to become one of the most exclusive developments in the area. There are no spec homes here; every parcel, starting at $945,000 for a view lot, is sold to a homeowner or investor, not to builders, which largely explains the scattered-lot appearance. As of January, 41 lots were either sold, under contract, or reserved, and 25 homes have been completed or are under construction in the three-plus years since Ascaya opened. And there’s no timetable for its build-out. TNAH 2019 is the exception to Ascaya’s no-spec rule, presenting an unusual opportunity to attract attention nationwide. It also will host the 2020 version, again to be designed and built by Sun West Custom Homes, on a view lot farther up the mountain. 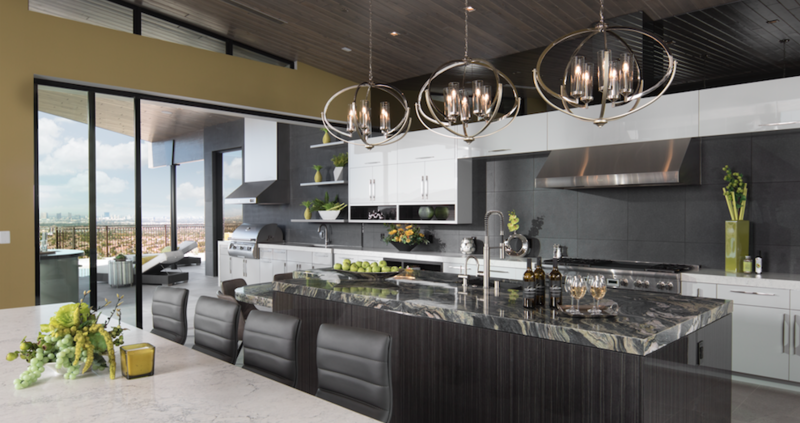 Designed by Dan Coletti, president of Sun West Custom Homes, The New American Home 2019 encompasses 8,200 square feet of conditioned living space on one level, including the show garage and lounge (A), within a total built area of nearly 12,000 square feet. The difference is primarily made up by an extensive outdoor living area along the rear elevation (B), the front entry courtyard (C), and a second two-car garage (D). 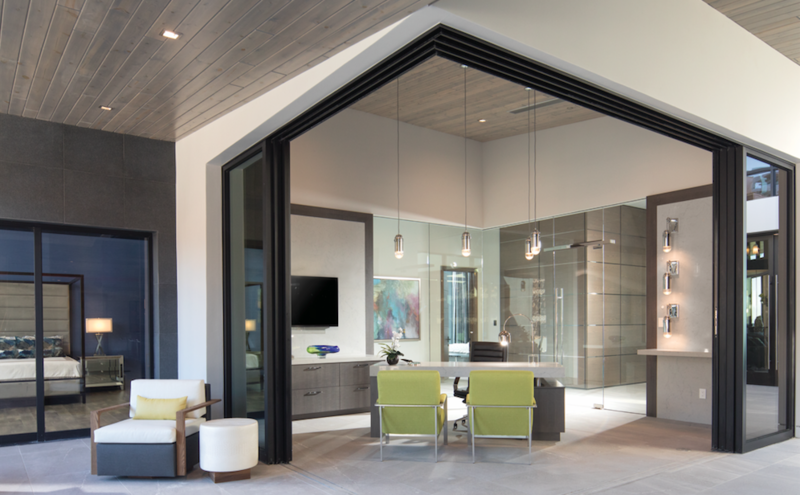 Indoor-outdoor transitions are plentiful and seamless, both to the entry courtyard and the outdoor living area, usually achieved with telescoping and often fully pocketed patio doors with embedded tracks that create flush thresholds. The west edge is basically a bedroom wing (see below) anchored by the owner’s suite (E), which looks out over the Las Vegas Valley, with a second bedroom suite (F) and a full-suite casita (G) with access to the entry courtyard. 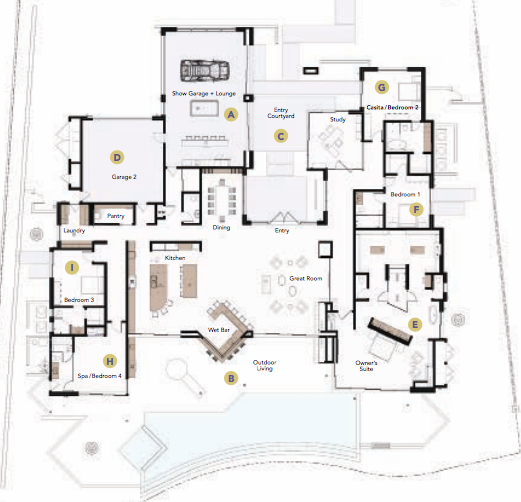 Along the east edge, the spa (H, also with a bathroom) and another bedroom suite (I) balance the plan and provide a measure of privacy for guests. 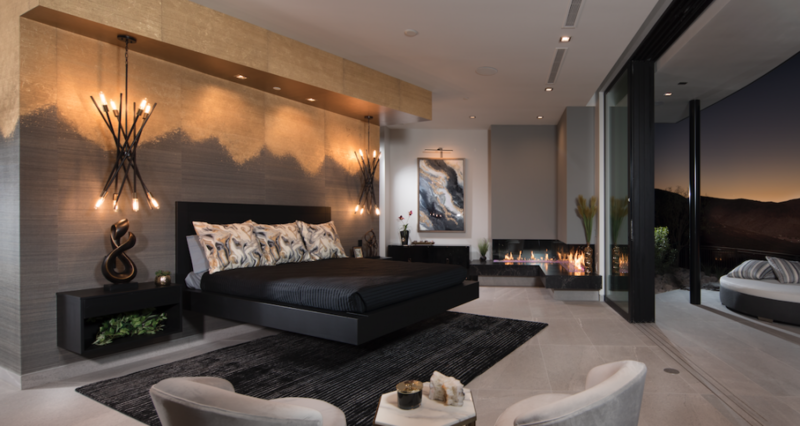 Owner’s Oasis: Coletti’s flair for the dramatic is on full display in the owner’s suite, which is punctuated by a cantilevered bed angled to take in the view. 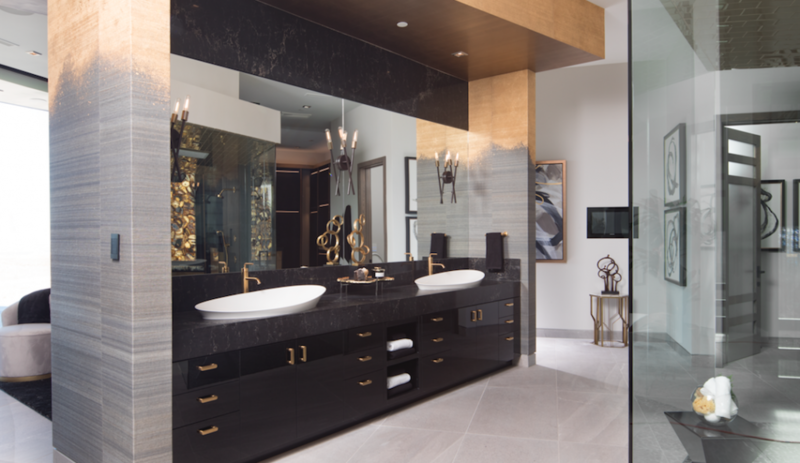 In the bath, a dual vanity runs along the wall behind the bed, while the glass-enclosed shower in the center of the room allows glimpses of the closet and changing area behind it. The shower’s location also enables convenient access to the closet from either side. Cynics may question whether an 8,200-square-foot house with this much glass can possibly be any shade of “green,” but it is ... and a darker shade than most homes at that. Regardless of the energy, water, and air-quality certifications the house earned, the facts are these: a HERS Index score of 45, or 55 percent more energy efficient than code; roof and wall insulation at R-57 and R-46, respectively, both well above minimum standards; an envelope with just 2.06 air changes per hour, balanced by controlled, fresh-air ventilation; ducts that are 63 percent tighter than code baseline; and a 58 percent reduction in total water use. Sun West Custom Homes and Smith offset the home’s 39 percent glass-to-wall ratio—far higher than typical—with a combination of high-efficiency glass for windows and patio doors (with gaskets and weatherstripping properly applied and sealed) and high levels of roof and wall insulation, namely a net-and-blow system for the framed cavities and 2-inch rigid foam on the exterior. “It’s critical to get the interlocking seals between patio door panels right,” says Smith, to ensure air tightness and optimal thermal benefit. In addition to low-water-use plumbing fixtures and appliances, the native and drought-tolerant landscaping is nourished as needed by a micro-drip irrigation system; instead of crushed gravel, larger cobblestones from Ascaya’s excavation percolate and retain rainwater for additional natural irrigation, as well. Read more about the products and materials used in The New American Home 2019 and a behind-the-scenes look at how the home was built. The Sun West Custom Homes project team and select TNAH 2019 task force members: seated (L-R): Suzanne Czar, senior interior designer, Sun West; Jennie Marsh, interior designer, Sun West; Tucker Bernard, executive director, NAHB Leading Suppliers Council; Carl Martinez, president of construction, Sun West; Dan Coletti, president, Sun West; Bridgette Slater, purchasing agent, Sun West; Adam Grubb, director of sales and digital media, SGC Horizon; Judy Brociek, director of events, SGC Horizon; Rich Binsacca, editor-in-chief, Professional Builder magazine. 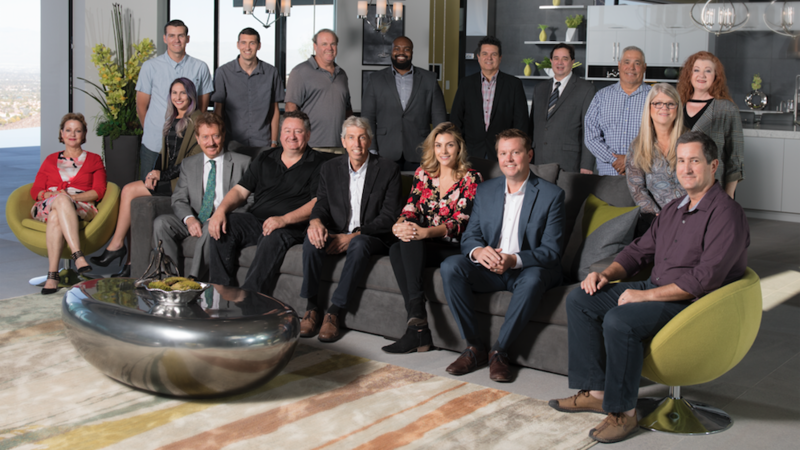 Standing (L-R): Kyle Coletti, assistant superintendent, Sun West; Chris Coletti, executive assistant, Sun West; Steve Ginther, superintendent, Sun West; Jamahl Gibbons, manager, IBS Show Homes, NAHB; Drew Smith, COO, Two Trails; Ted Mahoney III, TNAH 2019 task force chairman; Ed Torres, project manager, Sun West; Patty Martinez, director of sales and marketing, Sun West. Building Performance Consultant: Two Trails, Parrish, Fla.
Building Technology Consultant: Home Innovation Research Labs, Upper Marlboro, Md. 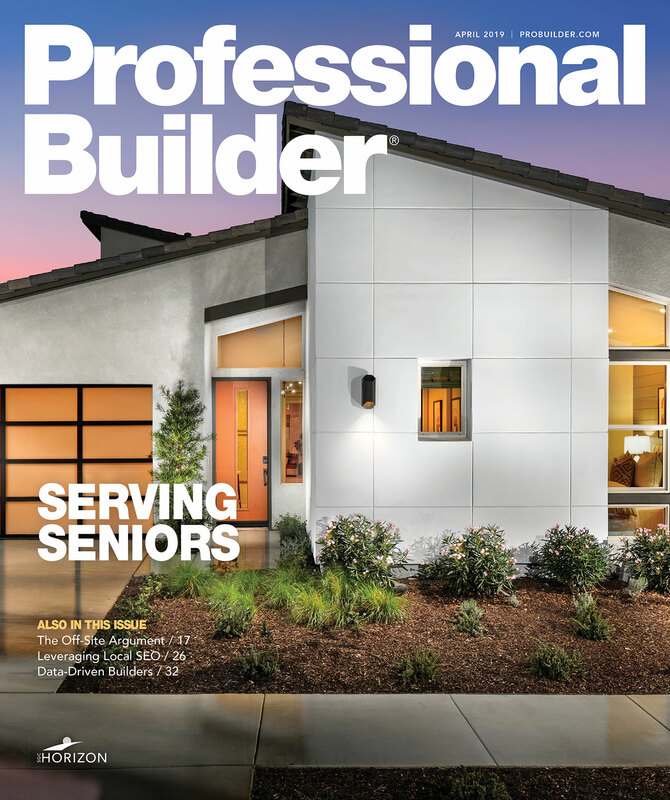 The New American Home program is a partnership between NAHB’s Leading Suppliers Council (LSC) and Professional Builder magazine / SGC Horizon. It wouldn’t be possible without the generous contributions of our valued sponsors. Find out details about the products and materials used in The New American Home 2019 and take a behind-the-scenes look at how the home was built.